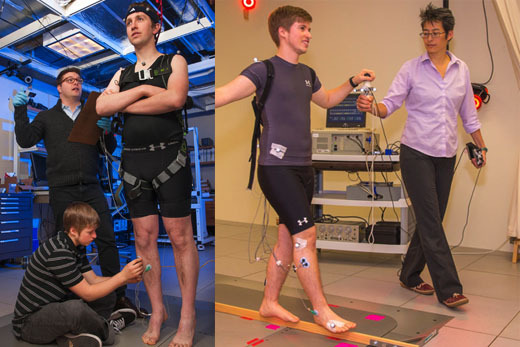 Two new grants to researchers at Emory University and the Georgia Institute of Technology will support studies that will increase our understanding of how balance and movement are affected in people with disorders such as Parkinson's disease, stroke and dystonia. J. Lucas McKay, PhD, MSCR, assistant professor (research) in the Wallace H. Coulter Department of Biomedical Engineering at Georgia Tech and Emory University, was awarded a four-year, $500,000 Mentored Quantitative Research Career Development Award from the National Center for Medical Rehabilitation Research (NCMRR), a sub¿institute of the Eunice Kennedy Shriver National Institute of Child Health & Human Development (NICHD) entitled "Neural mechanisms of balance deficits, falls, and freezing of gait in Parkinson's disease." The grant will allow McKay to apply his engineering background to help improve clinical outcomes for Parkinson's patients, working with faculty mentors, including Thomas Wichmann, MD, director of Emory's Morris K. Udall Center of Excellence for Parkinson's Disease Research, to better understand the scientific mechanisms of Parkinson's disease, and Stewart Factor, DO, director of the Emory Movement Disorders Clinic, to understand how recent advances in human movement science can be applied to the clinical management of Parkinson's disease. McKay will work with Lena Ting, PhD, professor of rehabilitation medicine at Emory and professor of biomedical engineering at Georgia Tech and Emory, to conduct laboratory-based movement studies in people with Parkinson's disease to identify new physiologic markers of fall risk. Ting was recently awarded a $1.7 million Collaborative Research Grant from the NICHD/NCMRR to develop computer simulations of how sensory signals are generated within the muscles for balance control. Tim Cope, PhD, a neuroscientist in the Coulter Department at Georgia Tech and Emory, and in the School of Applied Physiology at Georgia Tech, is co-principal investigator of the grant, along with Ken Campbell, PhD, a muscle physiologist at the University of Kentucky. The research is aimed at developing a fundamental understanding of how muscle spindle proprioceptive organs provide sensory awareness during movement. Proprioceptors feed information to the brain about the position and length of joints and muscles and the position of limbs in space, allowing people to maintain balance and move their limbs effectively. "We plan to predict changes in sensory function associated with chemotherapy-based sensory loss and other sensory neuropathies," explains Ting. "The establishment of this new model will provide a new basis for understanding and treating other sensorimotor disorders such as spasticity seen in stroke and spinal cord injury, rigidity in Parkinson's disease, and abnormal muscle contractions in dystonia." The awards follow a recent scientific paper by McKay, Ting, and collaborator Madeleine Hackney, PhD, research health scientist at the Atlanta VA Center for Visual and Neurocognitive Rehabilitation and assistant professor (research) in the division of general medicine/geriatrics at Emory. The paper describes changes in mechanisms of balance control in individuals with Parkinson's disease after dance-based rehabilitation. The work is published online and will be in the October issue of the Journal of Neurologic Physical Therapy.